Adding chit-chat to your bot makes it more conversational and engaging. 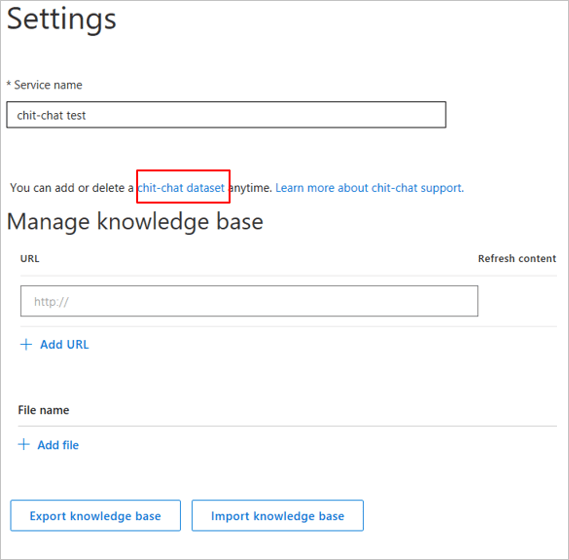 The chit-chat feature in QnA maker allows you to easily add a pre-populated set of the top chit-chat, into your knowledge base (KB). This can be a starting point for your bot's personality, and it will save you the time and cost of writing them from scratch. This dataset has about 100 scenarios of chit-chat in the voice of three personas - The Professional, The Friend, The Comic. Choose the persona that most closely resembles your bot's voice. Given a user query, QnA Maker tries to match it with the closest known chit-chat QnA. You are awesome I aim to serve. That's so nice of you! Flattery. I like it. Are you hungry? I don't need to eat. I only do food for thought. Eating would require a lot of things I don't have. Like a digestive system. And silverware. Sing a song I'm afraid I'm not musically inclined. La la la, tra la la. I'm awesome at this. You can't handle my dulcet tones. Will you marry me? I think it's best if we stick to a professional relationship. Aw, that's sweet. Sure. Take me to city hall. See what happens. Chit-chat support is currently available in English only. 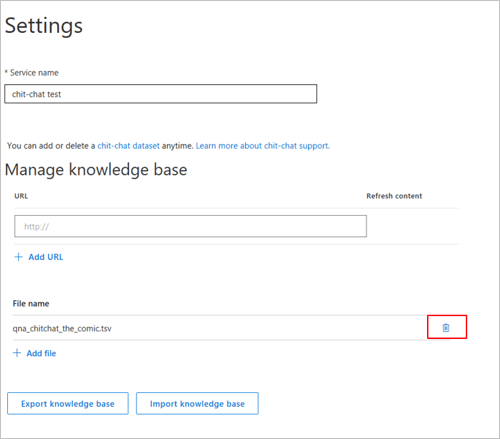 During knowledge base creation, after adding your source URLs and files, there is an option for adding chit-chat. Choose the personality that you want as your chit-chat base. If you do not want to add chit-chat, or if you already have chit-chat support in your data sources, choose None. Select your KB, and navigate to the Settings page. There is a link to all the chit-chat datasets in the appropriate .tsv format. Download the personality you want, then upload it as a file source. Make sure not to edit the format or the metadata when you download and upload the file. When you edit your KB, you will see a new source for chit-chat, based on the personality you selected. You can now add altered questions or edit the responses, just like with any other source. Select your KB, and navigate to the Settings page. Your specific chit-chat source is listed as a file, with the selected personality name. You can delete this as a source file.